Belfast murder: Who was ex-IRA man 'Jock' Davison? The man who was murdered at his home near Belfast city centre is reported to have been involved in a pub fight 10 years ago that would eventually lead to one of Northern Ireland's most high profile killings. 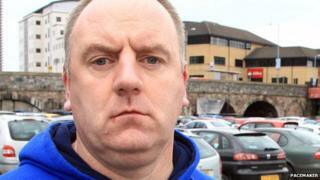 Gerard 'Jock' Davison, a former senior IRA figure in the city, was shot dead at his home in the Markets area on Tuesday. In January 2005, the prominent republican was there on the night that Robert McCartney, a 33-year-old father-of two, was stabbed to death outside a bar. The chain of events that led to Mr McCartney's death began inside Magennis's bar when his friend was involved in a row with Mr Davison that then spilled outside. No-one has ever been convicted of killing Mr McCartney, whose case came to international attention because of a campaign by his sisters, who blamed the IRA for murdering him and interfering with evidence and witnesses. They took their campaign for justice from the Short Strand in Belfast to Dublin, Downing Street and the White House. At first, Sinn Féin rejected claims that IRA members were present. The killing came at a crucial time for the party, when it was involved in delicate political negotiations aimed at securing its support for the police. It would eventually become clear that IRA members had indeed been involved in the killing in Market Street, a narrow side street beside the pub. Sinn Féin announced that it had suspended seven members of the party who were in the pub on the night of the murder, and the IRA even offered to shoot those responsible. While there were about 50 people in the pub on the night of the killing, none initially appeared willing to tell the police what they saw. Witnesses eventually came forward and in 2008, Mr Davison's uncle Terence was put on trial charged with murder, and two other men were charged with affray. 'Jock' Davison was a member of a very well known republican family, and was for some time one of the IRA's most senior commanders in Belfast. At one time he was said to have led Direct Action Against Drugs, a group responsible for the killings of more than a dozen drug dealers. He would have been well respected within republican circles but feared by many others. He was not charged in connection with the murder of Robert McCartney, but he was said to have played a central role in what happened. At the time it was claimed he had run his finger across his throat, indicating that Mr McCartney was to be killed. Police say they do not believe dissident republicans killed Mr Davison and they do not believe it was sectarian, ruling out any loyalist paramilitary connection. Detectives will look at the Robert McCartney murder to see if there was any kind of vendetta, but that happened more than 10 years ago, so I'm told they will also look at his more recent activities and whether he had run ins with criminal gangs or possibly drug dealers. During the course of the trial, the court heard excerpts of police interviews with Terence Davison, where he described the row between his nephew Gerard and Mr McCartney's friend Brendan Devine as "a storm in a teacup". He said the row broke out after a comment that his partner perceived was made to her. Terence Davison said he shook hands with Mr McCartney after an "amicable discussion" about the comment. However, he said a short time later a fight broke out between Mr Devine and his nephew which then spilled outside. Terence Davison told police: "People had been hurt on both sides. "There were no winners and I was just hoping they (Mr McCartney and Mr Devine) would leave the scene and we (Terence and Gerard Davison) could have gone straight to the hospital and everybody wakes up the following morning." The trial judge disputed Terence Davison's account that the exchange in the bar had ended amicably with handshakes. "Given the affray that clearly erupted in the bar as evidenced by the injuries Brendan Devine sustained to his throat and the amount of blood subsequently seen by PSNI scenes of crime officers throughout the bar, I doubt the truth of this assertion," he said in his judgement. Gerard Davison was arrested following the killing but later released without charge. In the weeks following Mr McCartney's killing, as his sisters' campaign gathered pace, Mr Davison denied ordering the attack. In recent years, Mr Davison had been a community worker in the working class Markets area of Belfast, near the city centre. He was shot dead close to his home as he was leaving for work.